I love cooking with my daughters and this week at #SundaySupper we are encouraging children to enter the kitchen. It is very important for them to stay tuned for all the steps followed before sitting on the table at dinner time. For this reason we want them to learn a lot more and get involved every day to elaborate easy and delicious dishes. The more time you spend helping a child in the kitchen they will want to try more things, new vegetables, meats and even the most unusual meals that you can imagine. Let your kids come into this wonderful world full of flavor, fun and learning and you will be helping them to expand the knowledge and palate. Children are very curious and we must not leave them behind in anything, help them and teach them that food is as healthy delicious and fun that is. This is one of the favorite recipes of my daughter, the only thing the she does not do is put these turnovers in the oven, because it still scares me a little, for the rest, she is quite a teacher, and what she loves most is lick her fingers filled with chocolate and cream cheese. 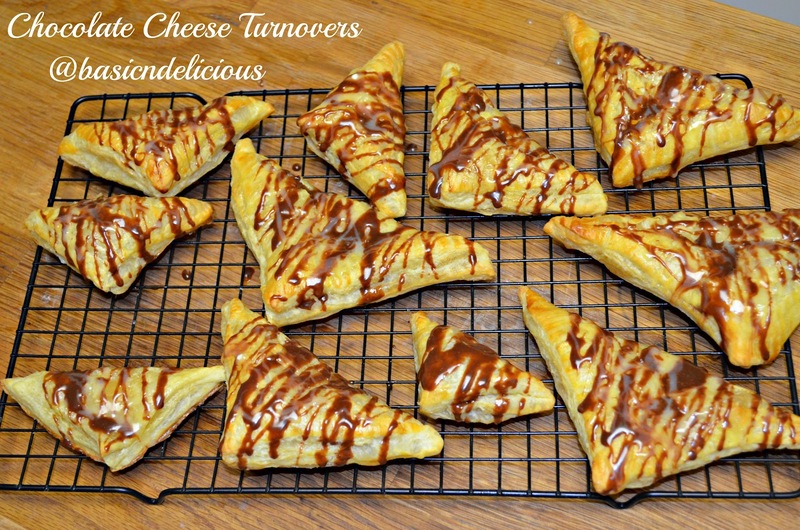 Hope you like and try to make these turnovers with your children. In a bowl mix the cream cheese, lemon juice and sugar until everything is well incorporated. Roll out puff pastry slightly and cut into squares. Place a teaspoon of cream cheese in the center of the piece of dough fold in half and then press the edges with a fork so that the filling does not come out while baking. Beat egg and water with a fork and brush the turnovers with a pastry brush. Bake for 10 minutes, when they are ready remove from the oven and place on a wire rack to cool completely. To decorate with the chocolate, place the heavy cream in the microwave and heat for 20 seconds, in separate bowl place the chocolate, add half of the heavy cream each one and stir until completely melted, decorate as you like. This recipe makes 12 turnovers. Here is a list of more recipes make by amazing cooks just for you and your kids. Brenda is hosting this special event and we would love for you to join us. We will be sharing great family recipes all afternoon and want you to share yours with us! Our #SundaySupper live chat will start at 3 pm EST. Follow us on twitter by using hashtag #Sundaysupper or using Tweetchat. We love to feature your recipes on our #sundaysupper pinterest board and share them with all our followers. This entry was posted in #SundaySupper and tagged cheese, chocolate, turnovers by Kathia Rodriguez. Bookmark the permalink.